Cicero is generally held to be one of the most versatile minds of ancient Rome. He introduced the Romans to the chief schools of Greek philosophy and created a Latin philosophical vocabulary, distinguishing himself as a linguist, translator, and philosopher. 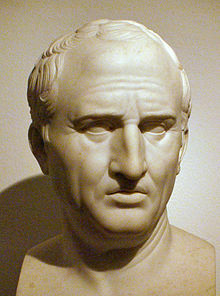 An impressive orator and successful lawyer, Cicero probably thought his political career his most important achievement. Today, he is appreciated primarily for his humanism and philosophical and political writings. His voluminous correspondence, much of it addressed to his friend Atticus, has been especially influential, introducing the art of refined letter writing to European culture. Cornelius Nepos, the 1st-century BC biographer of Atticus, remarked that Cicero's letters to Atticus contained such a wealth of detail "concerning the inclinations of leading men, the faults of the generals, and the revolutions in the government" that their reader had little need for a history of the period. During the chaotic latter half of the first century BC, marked by civil wars and the dictatorship of Gaius Julius Caesar, Cicero championed a return to the traditional republican government. However, his career as a statesman was marked by inconsistencies and a tendency to shift his position in response to changes in the political climate. His indecision may be attributed to his sensitive and impressionable personality; he was prone to overreaction in the face of political and private change. "Would that he had been able to endure prosperity with greater self-control and adversity with more fortitude!" wrote C. Asinius Pollio, a contemporary Roman statesman and historian. Cicero was declared a "righteous pagan" by the early Catholic Church, and therefore many of his works were deemed worthy of preservation. Saint Augustine and others quoted liberally from his works "On the Commonwealth" (also known as "On the Republic") and "On the Laws," and it is due to this that we are able to recreate much of the work from the surviving fragments. Cicero also articulated an early, abstract conceptualisation of rights, based on ancient law and custom. Of Cicero's books, six on rhetoric have survived, as well as parts of eight on philosophy. Of his speeches, eighty-eight were recorded, fifty-two of which survive today. Some of the items below include more than one speech. In defence of Gaius Rabirius"
Several works extant through having been included in influential collections of Ciceronian texts exhibit such divergent views and styles that they have long been agreed by experts not to be authentic works of Cicero. They are also never mentioned by Cicero himself, nor any of the ancient critics or grammarians who commonly refer to and quote passages from Cicero's authentic works. Cicero's letters to and from various public and private figures are considered some of the most reliable sources of information for the people and events surrounding the fall of the Roman Republic. While 37 books of his letters have survived into modern times, 35 more books were known to antiquity that have since been lost. These included letters to Caesar, to Pompey, to Octavian, and to his son Marcus. ^ Chisholm, Hugh, ed. (1911). "Cicero" . Encyclopædia Britannica (11th ed.). Cambridge University Press. Haskell, H.J. : (1946) This was Cicero, Fawcett publications, Inc. Greenwich, Conn.
Wikimedia Commons has media related to Writings of Marcus Tullius Cicero.